The weather has changed and so have the recipes we are craving in our little house. I spent all day yesterday in the kitchen, making gluten free focaccia based on the recipe in Gluten Free Baking Classics, to accompany the White Bean Salad which is a combination recipe from my mother-in-law and myrecipes.com. It actually calls for tuna but neither my mom-in-law nor I added it, enjoying the beans, hearts of palm (her brilliant addition), and capers with olive oil, vinegar, and fresh herbs on their own. I also squeezed some lemon juice on it, and added dried herbs along with the fresh (basil, oregano, the usual Italian ones.) Once I made it with green onions instead of the red onion it calls for and liked it just as well. 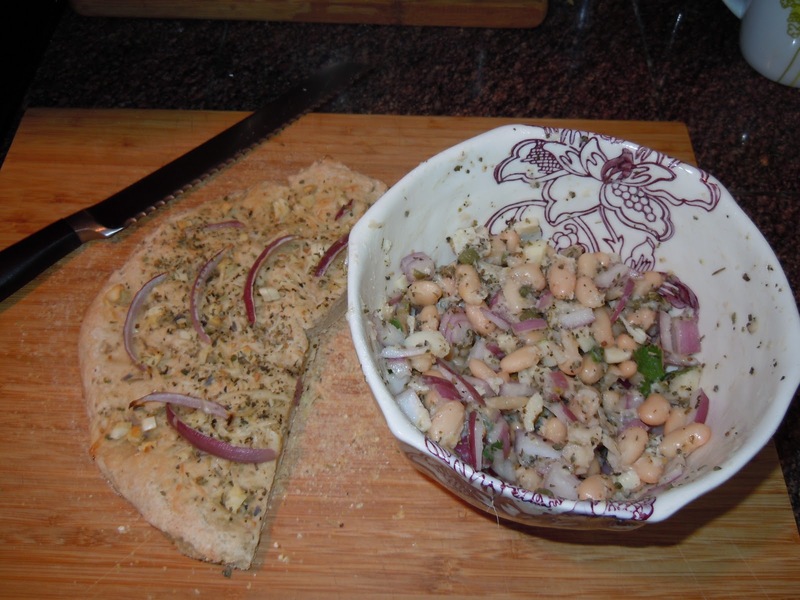 It is a great pairing~ the focaccia and the beans. My seven year old loved both, surprisingly, and seeing me in the kitchen all morning inspired him to make cookies. He got out his little cookbook and apron (I don’t even have an apron!) and we were warming the oven back up for chocolate chocolate- chip cookies. They turned out okay, both the boys liked them, but the recipe is definitely dubious. I too felt the need to make something sweet and dessert-y, but couldn’t find a recipe that didn’t require me to go to a store, which meant putting on clothes that weren’t lounge-around-the-house clothes and that just was not going to happen. Maybe today.